A commercial driver's license is required to operate a tractor-trailer for commercial use. A commercial driver's license is a driver's license required to operate large, heavy, or placarded hazardous material vehicles in commerce. Class A – Any combination of vehicles with a GVWR/GVW (Gross Vehicle Weight Rating/Gross Vehicle Weight) of 26,001 or more pounds provided the GVWR/GVW of the vehicle(s) being towed is in excess of 10,000 pounds. Class B – Any single vehicle with a GVWR/GVW of 26,001 or more pounds, or any such vehicle towing a vehicle not in excess of 10,000 pounds GVWR/GVW. Class C – Any single vehicle, or combination of vehicles, that does not meet the definition of Class A or Class B, but is either designed to transport 16 or more passengers, including the driver, or is required to be placarded for hazardous materials. Driving commercial motor vehicles (CMVs), which are primarily tractor-trailers (or Longer Combination Vehicles (LCVs)), requires advanced skills and knowledge above and beyond those required to drive a car or other lightweight vehicle. Before implementation of the commercial driver's license (CDL) Program in 1986, licensing requirements for driving larger vehicles and buses varied from state to state. Many drivers were operating motor vehicles that they may not have been trained or qualified to drive. This lack of training resulted in a large number of preventable traffic deaths and accidents. 1986 when the Act became law, all drivers have been required to have a CDL in order to drive a Commercial Motor Vehicle. The Federal Highway Administration (FHWA) has developed testing standards for licensing drivers. U.S. states are able to issue CDLs only after a written and practical test have been given by the State or approved testing facility. Class A: Any combination of vehicles which has a gross combination weight rating or gross combination weight of 11,794 kilograms or more (26,001 pounds or more) whichever is greater, inclusive of a towed unit(s) with a gross vehicle weight rating or gross vehicle weight of more than 4,536 kilograms (10,000 pounds) whichever is greater. Class B: Any single vehicle which has a gross vehicle weight rating or gross vehicle weight of 11,794 or more kilograms (26,001 pounds or more), or any such vehicle towing a vehicle with a gross vehicle weight rating or gross vehicle weight that does not exceed 4,536 kilograms (10,000 pounds). Class C: Any single vehicle, or combination of vehicles, that does not meet the definition of Class A or Class B, but is either designed to transport 16 or more passengers, including the driver, or is transporting material that has been designated as hazardous under 49 U.S.C. 5103 and is required to be placarded under subpart F of 49 CFR Part 172 or is transporting any quantity of a material listed as a select agent or toxin in 42 CFR Part 73. A state may also require a driver to have a CDL to operate certain other vehicles legally. A driver licensed in New Jersey must have a CDL to drive legally a bus, limousine, or van that is used for hire, and designed to transport 8 to 15 passengers. A driver licensed in New York must have a CDL to legally transport passengers in school buses and other vehicles listed in Article 19-A of the state's Vehicle and Traffic Law. Drivers licensed in California must have a CDL if their primary employment is driving, whether or not they actually drive a commercial vehicle. California defines a commercial vehicle as one that transports for hire either people or products. In addition, possession of a CDL in California changes the threshold for a Driving Under the Influence citation from 0.08% to 0.04% Blood Alcohol Content. Prospective licensees should verify CDL requirements by referencing their state specific CDL Manual. The minimum age to apply for a CDL is usually 21, as required by the United States Department of Transportation, although some states allow drivers who are 18 to 20 to apply for a CDL that is valid only within the driver's state of residence. A single state CDL only restricts driving of CMVs within the holder's state (not non-commercial vehicles), and automatically converts to a 50 state CDL at the age of 21. T, P, S, N, H and X are Federal endorsements. Any other endorsements have been promulgated at the State level. i.e. New York DMV requires a "W" endorsement to legally operate a tow truck in New York. Depending on your State, the education requirements vary. Some states (Ohio) for example requires 160 hours or classroom and on the road training. Training may be obtained by completing a qualified CDL training program through a truck driving school. These training programs specialize in teaching potential truck drivers the necessary skills and knowledge to properly and safely operate a truck, including map reading, trip planning, and compliance with U.S. Department of Transportation laws, as well as backing, turning, hooking a trailer, and road driving. The overall purpose of these training schools is to help truckers-to-be pass the CDL knowledge and skills tests as well as advanced driving techniques such as skid avoidance and recovery and other emergency actions for situations such as a break away trailer and hydroplaning. These classes usually go well beyond the training the typical non-commercial driver receives, such as the drivers education provided in high school. There are a number of licensed CDL training schools around the United States and many trucking companies operate their own schools as well. Although each state may add additional restrictions, there are national requirements which are as follows. A prospective driver must pass a written test on highway safety and a test about different parts of a truck with a minimum of 30 questions on the test. To pass this knowledge test, student drivers must answer at least 80 per cent of the questions correctly. To pass the driving skills test the student driver must successfully perform a set of required driving maneuvers. The driving skill test must be taken in a vehicle that the driver operates or expects to operate. For certain endorsements, such as Air Brakes, the driving skills test must be taken in a vehicle equipped with such equipment. You will also need to show you do in fact show the characteristics of an aware and fully operative driver. This does not exclude certain disabilities, however, you must meet standard requirements, required by the safety operators. Employers, training facilities, States, governmental departments, and private institutions may be permitted to administer knowledge and driving test for the State. The test must be the same as those given by the State issuing the CDL and the instructors must meet the same professional certification as State instructors. States are required to conduct an inspection of any testing facility and evaluates the programs by taking an actual test as if they were testing driver at least once a year, or by taking a sample of drivers tested by the third party and then comparing pass/fail rates. In addition, the State's agreement with the third party testing centers must allow the FMCSA and the State to conduct random examinations, inspections, and audits without notice. In 2014, the law regarding drivers in pursuit of a CDL was modified and requires a DOT medical examiner to authorize a person with a medical issue to be able to drive. Prior to the change, a private doctor was able to authorize a driver to obtain a CDL. Most CMV drivers must prove they are healthy enough to safely drive a truck. A valid medical certificate must be filled out by a medical professional listed on the National Registry of Certified Medical Examiners at the conclusion of an extensive physical exam, with a copy provided to the state Bureau (or Department) of Motor Vehicles compliance unit. Some examples of an impairment which disqualifies a driver include the inability to grasp a steering wheel or operate foot pedals, insulin use, certain cardiac and respiratory problems, markedly elevated blood pressure, epilepsy, some severe psychiatric disorders, certain color blindness, poor corrected vision in either eye (worse than 20/40), bilateral hearing loss, active alcoholism, and other conditions which significantly increase the risk of a medical emergency behind the wheel. See Physical qualifications for drivers page of the Federal Motor Carrier Safety Administration. Not all medical providers are able to test and complete the medical certification form. (a)(8)(iii) C for Small Vehicle. (a)(9)(vii) At the discretion of the State, additional codes for additional groupings of endorsements, as long as each such discretionary code is fully explained on the front or back of the CDL document. The Commercial Driver's License Information System (CDLIS) and the National Driver Register (NDR) exchange information on traffic convictions and driver disqualifications of commercial drivers. States have to use both CDLIS and NDR to check a driver's record before a CDL can be issued. To gain permission to access to the CDLIS and NDR databases one should visit the Federal Motor Carrier Safety Administration (FMCSA) Technical Support Web site for instructions on how this information is accessed and who can access it. Trucking companies can use a commercial service that has clearance for providing this information as a means of screening prospective employees. Driving without a CDL, or suspended CDL, incurs a civil penalty of up to US$2,500 or, in aggravated cases, criminal penalties of up to US$5,000 in fines and/or up to 90 days in prison. An employer is also subject to a penalty of up to US$10,000 if they knowingly permit a driver to operate a CMV without a valid CDL. Two or more serious traffic violations, including excessive speeding, reckless driving, improper or erratic lane changes, following the vehicle ahead too closely, and traffic offenses in connection with fatal traffic accidents, within a three-year period: a 90-day to five-year suspension. One or more violations of a Motor vehicle declared out of service order within a 10-year period: one-year suspension. Driving under the influence of a controlled substance or alcohol, or leaving the scene of an accident, or using a CMV to commit a felony: three-year suspension. Any of the one-year offenses while operating a CMV for hazardous materials or second offense of any of the one-year or three-year offenses, or using a CMV to commit a felony involving manufacturing, distributing, or dispensing controlled substances: life suspension. States can reduce certain lifetime disqualifications to a minimum disqualification period of 10 years if the driver completes a driver rehabilitation program approved by the State. Not all states do this: it is available in Idaho and New York State but not California or New Jersey. If a CDL holder is disqualified from operating a CMV they cannot be issued a "conditional" or "hardship" CDL, but can continue to drive non-commercial vehicles. Any convictions are reported to the driver's home State and Federal Highway Administration and these convictions are treated the same as convictions for violations that are committed in the home State. The Commercial Drivers License Program collects and stores all convictions a driver receives and transmits this data to the home State so that any disqualification or suspension can be applied. The FHWA has established 0.04% as the blood alcohol concentration (BAC) level at or above which a CMV driver is deemed to be driving under the influence of alcohol and subject to lose his/her CDL. Additionally, an operator of a CMV that is found to have 'any detectable amount of BAC above 0.0%' will be put out of service for a minimum of 24 hours. A driver must report any driving conviction within 30 days, except parking, to their employer regardless of the nature of the violation. Employers must be notified if a driver's license is suspended, revoked, or canceled. The notification must be made by the end of the next business day following receipt of the notice of the suspension, revocation, cancellation, lost privilege or disqualification. Employers cannot under any circumstances use a driver who has more than one license or whose license is suspended, revoked or canceled, or is disqualified from driving. Violation of this requirement may result in civil or criminal penalties. The Bureau of Labor Statistics and additional publications identified a future need for over 90,000 truck drivers in the United States for the next 10 years. In order to improve upon the shortage, full scholarships are being awarded to military veterans at CDL-A schools and truck driving companies. In the United Kingdom the PCV Licence (PCV stands for Passenger Carrying Vehicle) enables the holder to drive buses and/or minibuses, subject to what kind of Practical Driving Test the licence holder passes. Category D1 allows the holder to drive a vehicle with between nine and sixteen passenger seats with a trailer up to 750 kg maximum authorised mass. Category D1+E allows the holder to drive a vehicle with between nine and sixteen passenger seats with a trailer over 750 kg maximum authorised mass, provided that the maximum authorised mass of the trailer does not exceed the unladen mass of the vehicle being driven and the combined maximum authorised mass of both the vehicle and trailer does not exceed 12 t (12000 kg). For example, a vehicle with an unladen mass of 2650 kg and a MAM of 4005 kg, with a trailer MAM of 2200 kg will give a combined MAM of 6205 kg - but the Unladen Mass of the vehicle being driven (2650 kg) is greater than the MAM of the trailer (2200 kg) so is acceptable. However, a vehicle with an unladen mass of 2650 kg and a MAM of 4005 kg, with a trailer MAM of 2700 kg will give a combined MAM of 6705 kg - but because the MAM of the trailer (2700 kg) exceeds the Unladen Weight of the vehicle being driven (2650 kg), you would need a Category D+E licence to drive that vehicle. Category D allows the holder to drive a vehicle with more than eight passenger seats with a trailer up to 750 kg maximum authorised mass. Category D+E allows the holder to drive a vehicle with more than eight passenger seats with a trailer over 750 kg maximum authorised mass. All places in Australia have a mostly similar driver licence system, although some things can change in each state or territory (e.g. what classes of license are available). GVM is the maximum recommended weight a vehicle can be when loaded. A 'Class C' Licence allows the holder to drive cars, utilities, vans, some light trucks, car-based motor tricycles, tractors and implements such as graders. You can also drive vehicles that seat up to 12 adults, including the driver. R Rider: Motorcycle riders require a 'Class R' licence. LR Light Rigid: 'Class LR' covers a rigid vehicle with a GVM of more than 4.5 tonnes but not more than 8 tonnes. Any towed trailer must not weigh more than 9 tonnes GVM. This class also includes vehicles with a GVM up to 8 tonnes which carry more than 12 adults including the driver and vehicles in class 'C'. MR Medium Rigid: 'Class MR' covers a rigid vehicle with 2 axles and a GVM of more than 8 tonnes. Any towed trailer must not weigh more than 9 tonnes GVM. This class also includes vehicles in class 'LR'. HR Heavy Rigid: 'Class HR' covers a rigid vehicle with 3 or more axles and a GVM of more than 8 tonnes. Any towed trailer must not weigh more than 9 tonnes GVM. This class also includes articulated buses and vehicles in class 'MR'. HC Heavy Combination: This licence covers heavy combination vehicles like a prime mover towing a semi-trailer, or rigid vehicles towing a trailer with a GVM of more than 9 tonnes. This class also includes vehicles in class 'HR'. MC Multi-Combination: This licence covers multi-combination vehicles like Road Trains and B-Double Vehicles. It also includes vehicles in class 'HC'. The medical standards for drivers of commercial vehicles are set by the National Transport Commission and Austroads, and are set out in 'Assessing Fitness to Drive' (available from the Austroads website). For those applying for heavy vehicle licence classes MR (Medium Rigid), HR (Heavy Rigid), HC (Heavy Combination) or MC (Multi Combination), it is strongly recommended that the applicant ensures they meet the medical requirements before commencing any training or tests for a heavy vehicle licence. The driver of a vehicle carrying paying passengers (such as a school bus or tourist coach) requires an appropriate driver licence and a 'Public Passenger Vehicle Driver Authority' which is issued by the Ministry of Transport. In New Zealand, driver licensing is controlled by the NZ Transport Agency. There are six classes of motor-vehicle licence and nine licence endorsements. Class 1 governs vehicles with a GLW (gross laden weight) or GCW (gross combined weight) of less than 6,000 kg, and Class 6 governs motorcycles. Classes 2–5 govern heavy vehicles. any vehicle covered in Class 1.
any vehicle covered in classes 1 and 2.
vehicles covered in classes 1 and 2, but not Class 3.
vehicles covered by classes 1, 2, 3 and 4. Before getting a Class 2 licence, a driver must be at least 18 years of age and have held an unrestricted Class 1 licence for at least six months. Gaining a Class 5 is not dependent on holding a Class 3. Once a driver has a Class 2 they can progress straight through to Class 4 and Class 5. Each progression (2 to 3, 2 to 4, or 4 to 5) requires having held an unrestricted licence of the preceding class for at least six months. For drivers aged 25 or over the minimum period for holding the unrestricted time is reduced to three months, or waived entirely on completion of an approved course of instruction. W - Wheels: Special vehicle equipped with wheels, other than fire appliances, buses, tractors, vehicle-recovery vehicles, or trade vehicles. The F, R, T and W endorsements are for operating special types of vehicle on the road. Where the holder also has a heavy vehicle (Class 2 or Class 4) licence, they are permitted to drive heavy special vehicles. Otherwise the limits for Class 1 (6,000 kg) apply. Being granted an I, O, P and/or V endorsement requires that the applicant passes a "fit and proper person" check, to screen for people with criminal convictions or serious driving infringements. These endorsements are issued for one or five years, at the option of the applicant at the time of purchase. In Hong Kong, Transport Department is responsible for issuing driver licences. Private light bus (class 4), public light bus (class 5), taxi (class 6), private bus (class 9), public bus (class 10), franchised public bus (class 17), medium goods vehicle (class 18), heavy goods vehicle (class 19), articulated vehicle (class 20) and special purpose vehicle (class 21) are vehicles requiring commercial driving licences., whereas private car (class 1), light goods vehicle (class 2), motorcycle (class 3), and motor tricycle (class 22) are considered non-commercial vehicles. To apply for a commercial driving licence, a driver must: - be of age 21 or above; - have obtained a private car or light goods vehicle full driving licence for at least 3 years (2 years if converted from probationary licence) immediately before the application; - be a Hong Kong permanent resident or not subject to any condition of stay other than a limit of stay; - have not been convicted of some serious driving offences specified in law within 5 years before the application; and take a driving test of the class of vehicle the driver is going to apply. 6 (Taxi) — Only a written test has to be taken, including traffic regulations, taxi regulations and places. 9 (Private bus), 10 (Public bus) — Passenger vehicles with 17 seats or more. The driving tests for both are the same, and class 4 (private light bus) licence is issued automatically at the same time when applying class 9, 10 licences after passing the test. In addition, class 5 (public light bus) licence can be applied after taking an additional Pre-service Training Course for Public Light Bus Drivers. 17 (Franchised public bus) — This is obtained through training within a franchised bus company, for example, Kowloon Motor Bus. The driving test requirement is the same with public bus (class 10), and is only retained with historical interest. A driver passing a test on a franchised bus will be issued classes 4, 9, 10 in addition to 17, and 5 after taking an additional Pre-service Training Course for Public Light Bus Drivers, enabling him/her to drive any public buses, whereas a driver holding class 10 (public bus) licence can also drive franchised public bus. Class 17 exists because the government had to protect the interests of franchised bus companies, in the past, drivers trained by a franchised bus company could only get a class 17 licence, enabling him/her to drive franchised public bus only but not other public buses. This has been relaxed such that a driver passing test on a franchised public bus can get classes 9, 10 in addition to class 17, and original drivers holding class 17 without classes 9, 10 can also apply them for free without taking tests. 18 (Medium goods vehicles) — Goods vehicles with maximum gross weight above 5.5 tonnes and not exceeding 24 tonnes. Class 2 (light goods vehicles) licence is issued in addition to class 18 after passing the test. 19 (Heavy goods vehicles) — Goods vehicles with maximum gross weight above 24 tonnes. Class 2 (light goods vehicles) and class 18 (medium goods vehicles) licences are issued in addition to class 19 after passing the test. 20 (Articulated vehicle) — The driver has to obtain full licence of class 18 (medium goods vehicles) before applying. Class 19 (heavy goods vehicles) licence is issued in addition to class 20 after passing the test. 21 (Special purpose vehicle) — Includes street washing vehicles, arrow vehicles, road maintenance vehicles, ice cream vehicles, etc. A driver has to apply with endorsement from his/her company, and holding a full licence of class 2 (light goods vehicle), 18 (medium goods vehicles) or 19 (heavy goods vehicles). Class 21 licence has to be used in conjunction with a class 2, 18 or 19 licence, allowing the driver to drive special purpose vehicles with maximum gross vehicle weight up to the goods vehicle licence the driver holds. ^ "Commercial Driver's License Program". Federal Motor Carrier Safety Administration. Archived from the original on 2009-03-13. Retrieved 2009-03-15. ^ "Part 391: Qualifications of drivers and longer combination vehicle (LCV) driver instructors (subpart 391.65)". Federal Motor Carrier Safety Association (FMCSA). Archived from the original on 2009-04-08. Retrieved 2009-03-12. ^ "Commercial Driver's License (CDL) Program". Federal Motor Carrier Safety Administration (FMCSA). Archived from the original on 2009-03-13. Retrieved 2009-03-12. ^ a b "CDL Class Definitions". Itd.idaho.gov. Archived from the original on 2006-08-11. Retrieved 2006-08-20. ^ "Drivers". Fmcsa.dot.gov. Archived from the original on 2017-05-10. Retrieved 2017-04-06. ^ a b "New Jersey Commercial Driver License Manual". State.nj.us. March 8, 2017. Retrieved April 8, 2019. ^ a b c "New York State Commercial Driver's Manual". Dmv.cca.gov. Archived from the original on 2010-10-09. Retrieved 2006-10-25. ^ a b "State of California Commercial Driver's Manual" (PDF). Dmv.cca.gov. Archived (PDF) from the original on 2012-05-23. Retrieved 2012-06-21. ^ "Actions Resulting in Loss of License - Alcohol Impairment Charts - Driving Under the Influence of Alcohol and/or Drugs / is illegal" (PDF). Dmv.ca.gov. Archived (PDF) from the original on 18 May 2013. Retrieved 27 September 2012. ^ "Directory of State CDL Manuals". Exam-test.com. Archived from the original on 2009-04-17. Retrieved 2009-04-11. ^ "California Commercial Driver Handbook". Dmv.cca.gov. Archived from the original on 2006-10-25. Retrieved 2006-10-25. ^ "Appendix C to Part 658". Federal Motor Carrier Safety Administration. Archived from the original on 2008-02-13. Retrieved 2008-02-04. ^ "US CDL Requirements by State". Findatruckingjob.com. Archived from the original on 2010-08-15. Retrieved 2010-08-13. ^ Vehicles, Department of Motor. "DMV: CDL - Certified Medical Examiners". www.ct.gov. Archived from the original on 2017-09-02. ^ "Part 383: Commercial driver's license standards; requirements and penalties". Federal Motor Carrier Safety Association. Archived from the original on 2009-04-08. Retrieved 2009-03-12. ^ "Heavy and Tractor-trailer Truck Drivers : Occupational Outlook Handbook: : U.S. Bureau of Labor Statistics". Bls.gov. 2015-12-17. Archived from the original on 2017-03-24. Retrieved 2017-04-06. ^ "Swift Transportation - Veterans". Swifttrans.com. Archived from the original on 2017-04-07. Retrieved 2017-04-06. ^ "Scholarship | United Truck Driving School". 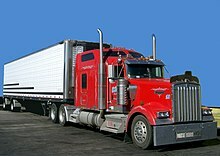 Unitedtruckschool.net. Archived from the original on 2017-04-07. Retrieved 2017-04-06. ^ "Classes of driver licence in New Zealand". drivingtests.co.nz. Archived from the original on 2017-07-01. Retrieved 2017-05-17. ^ "Transport Department - Procedures for Obtaining a Full Driving Licence with Driving Test". Td.gov.hk. Archived from the original on 2017-05-16. Retrieved 2017-04-06. This page was last edited on 8 April 2019, at 15:53 (UTC).